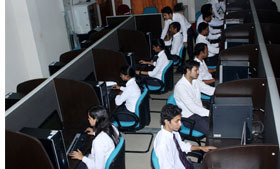 The Wi-Fi enabled air conditioned computer centre of the Institute has an impressive range of latest computer hardware, software and many other ICT devices. The laboratory is well equipped with latest configuration which brings students in close proximity with the world of information technology. The Nodes are well connected through Windows based local area network with switch technology. All nodes are supported with good quality of multimedia application. The laboratory is equipped with software like MS-Office, CRS package, Macromedia Flash, Adobe Photoshop, Tally and SPSS. Computer support services are designed to provide students with help, advice and full assistance in their coursework. Other facilities include 24-hour Internet access high speed broad band connection, access to online library, in- house publishing facilities, LCD / Plasma Screen Projection Systems. computer skills and hands on exposure.